"Hope is the only universal liar who doesn't lose his reputation for veracity"
Bank Holiday Monday, just gone ten to five. Still slightly in shock at events at the Madjeski, where you have come from two down to beat a top 6 side who comprehensively out-played you at home a couple of months earlier. Sat in your armchair, cursing Leeds' failure to consolidate their play off push at Selhurst Park, your mind wanders ahead. That feint shred of hope that the unexpected might happen. 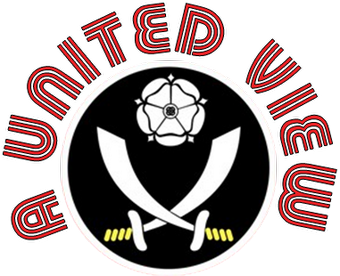 As Sky Sports News put up the words "Sheffield United Relegated" alongside "Reading 2 - Sheffield United 3" you raise from your armchair, finger raised, "Ah no! Not yet! We are not mathematically down. Don't even think about putting that effing 'R' next to us in the league table! ", glancing round to check that the children aren't listening….they're not. You didn't expect it to come to this. Mid-table again, maybe slightly below at worst. It's a pretty average division, anyone can be up there for promotion, so-called bigger teams can be dragged into what they call the relegation dogfight, but not us. We will have a bit more about us than that, we wont make the same mistakes with loans and signings that we did last year…..will we? Then the season starts, upheaval, followed by upheaval, with loans, followed by more loans. Christmas arrives with things looking dire, but renewed hope as a boyhood fan takes over and we all remember what happened last time we had one of those. 1, 2, 3, 4, 5, 6, still counting, 7, 8, 9, 10, surely soon, 11, 12, 13, 14 games go by before a win arrives. Bruised and bloodied, we can get off the canvas, we can still pull through on points. Back to work and everyone wants to talk about your club. When asked, you agree that your team is down. "We've been dead and buried for weeks. When we lost to Palace, Scunthorpe and Derby in the same week, that's where we blew it. We were two up at Scunthorpe for God's sake". You blush slightly, because you are lying, just a little bit, because your head is controlling your mouth, but your heart cannot be repressed. Whilst speaking you play out scenarios in your mind. If we can put 3 or 4 past Barnsley and Donny and Palace go down 2 or 3 against Leicester and at Hull? Hull could still chase an outside chance of the play offs. If Swansea have nothing to play for in the last game of the season and rest a few players…and we beat them at full strength at home. Forest might still be trying to seal a play off place going to Selhurst on the final day, they wont roll over and they have the fire power. Regretfully remembering the match at home to Boro, just two weeks ago, chance after chance missed, before conceding late on. Three points dropped, realistically one, one point that might have meant not having to rely on 8 or 9 goal swings and other's failures. You had written them off then, season finished, and the defeats Cardiff and PNE that followed properly sealed it. You had accepted your fate. Embarrassed by the weakness of their submission, awaiting the revengeful glee of your mates who support the other lot. The same supporters and friends who you had remorselessly ripped into twelve months ago. Then, two games two victories and renewed hope flickered. What of the clubs you have chased down the final straight, like the back-runner chasing down the leading pack and leaving his final sprint 10 metres too late, wishing the race was 1510m instead of 1500. If only you could play another couple of games……. You read messages congratulating them on their survival, of remaining in situ for another season. Those Palace and Doncaster supporters play it down, "Still to make sure", "Still need a point", but you know deep down they believe they are safe. You know deep down, your club is far from safe, but still you look for the positive. You remember Oldham, 8 points from safety with one week of the 1992-93 Premier league season left…..they survived. Bradford City beat Liverpool on the final day in 2000 to survive. West Brom moved up three places when all above them lost on the final day in 2005. Then those memories are swamped by others. Of sitting high up in the gods at Stamford Bridge on the 7th May 1994 as Mark Stein scored in the last minute and your team were relegated following a bizarre series of events at Goodison Park which were relayed by fellow fans, radios clutched tightly against their ears. Of last minute play off final defeat against Palace in 1997. Of last day Premier League heartache in 2007. You then realise that when the unexpected happens, it tends to happen in a bad way for your team. Tuesday comes and your youthful reserves beat Port Vale's second string 6-0, you're reminded of a great 6-0 league victory over Spurs. You think maybe the first team can do that on Saturday. Tuck away goals like Brian Deane, Jocky Bryson and Paul Rogers did that night, and then it hits home that, although it seems like yesterday, it was 18 long years ago. The fact that over the course of this season your team has averaged less than a goal a game and are the second lowest scorers in the division starts to sink in……Ah but we have scored 6 in our last two games! Yes but we have also conceded 4 and then you remember we have got Neil Collins and you are temporarily subdued once more. You sit there and consider League One might not be a bad thing playing wise. You think of the FA Youth Cup Final, upcoming against Manchester United. Those promising young players, might be better blooded at a lower level, build a new side, a future of talented kids, pepped up with experienced older heads. Less expectation on them as a result, none of the braggadocio displayed by certain other clubs following their fall from the Championship. But you wonder whether other fans would really accept that? Can we financially adapt, when an immediate return may not be achieved? They will just sell all our promising youngsters, just like they always do? How long could we wait to return? It feels like a lonely world, trapped in a psychological game balancing reason and probability, with blind optimism, faith and a massive degree of hope. A to-ing and fro-ing of positivity and negativity that frazzles the brain. Yet you know it is a game being played out not just by supporters of your team, but by supporters of all teams of all levels, across the globe. Some hoping for safety from relegation, some hoping for promotion others just hoping for financial survival and a continuation of being able to support their club. A true global game, played out by individuals who have little or no influence on the outcome. Saturday will either bring renewed hope or despair. Even a win might not be enough to prevent despair. Like most playing the game; I don't mind the despair, I can deal with the despair, it's the hope that is killing me right now. Great piece. Brought back memories of many seasons watching Newcastle. 88-89 and we had a team to win the league until we went 1-0 down at Goodison after 34 seconds of our opening game. Dead and buried all the way to Easter when we beat Everton and Norwich in successive games. We couldn't, could we? Sheffield Wednesday at home, Easter Monday (I think), and for the first time since August I really believed. 3-1. To them.